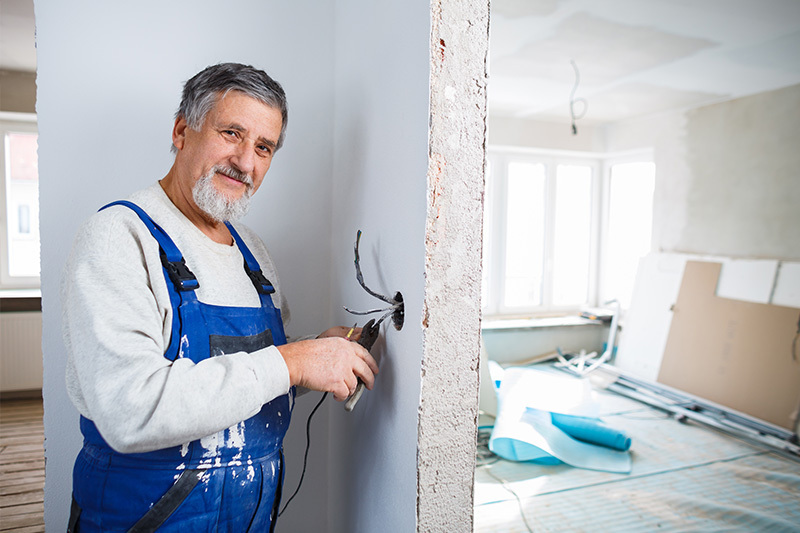 If you’re considering moving and want to fix up your home, experts recommend renovations that make the most financial sense. Maybe you’ve been watching too many home-improvement TV shows, but suddenly your kitchen is looking a bit dated—like the 1970s. At the same time, you and your spouse have been talking about finding a smaller place as you get older. You’re not ready to move now, but somewhere down the road, when it gets too difficult to climb the stairs and shovel snow. If you don’t plan on living in your home for the rest of your life, what’s the best home-improvement investment you can make? To predict your return on investment (ROI) potential, look at your home’s value and the value of other homes in the neighborhood or city where you live. If housing prices have been low in your neighborhood, it may not pay to make upgrades. Your ROI can vary widely, depending on where you live. Remodeling offers regional comparisons. Experts focus their recommendations on two issues: curb appeal, such as a new garage door; and maintenance/structural issues, like a new roof. Also factor in which improvements will bring you the most pleasure during your remaining time in the home. Although decidedly unglamorous, replacing your home’s roof—at an estimated cost of $7,600—is one of the best improvements you can make. One survey found a 105 percent gain in investment, meaning that your home’s value would increase so much that you would recoup more than 100 percent of the amount you paid for a new roof. Another survey put the value at 72 percent. While a new roof might not attract buyers, an old roof can discourage them after they get the inspection report. Upgrading your home’s insulation—at an average cost of $2,100— provides a generous cost-value ratio. One survey cited a 117 percent return at resale, while another estimated 95 percent. Good insulation increases energy efficiency, which keeps the house warmer and reduces heating costs. Often, homeowners add fiberglass insulation to the attic and caulk around doors and windows. Replacing your home’s garage door, especially if it’s the old metal variety, adds to your home’s curb appeal. One survey estimated the cost of a new garage door at $2,300, with 87 percent recovered at resale. Popular designs include carriage-style, natural-wood and windowed garage doors. Similarly, front-door replacement can increase curb appeal and energy efficiency. One survey found a 91 percent return at an estimated cost of $2,000. Dirty and worn siding sends a message that a house isn’t being taken care of, and prospective homebuyers often assume that the outside mirrors what’s inside. Estimates for a return on new siding vary from 75 to 83 percent at an average cost of $12,000. Replace your home’s tattered exterior with vinyl or fiber-cement siding. Vinyl is less expensive and easier to install and maintain, but fiber-cement siding will last longer and its components are more environmentally friendly. Add more space. These days, people want bigger houses. In especially hot markets, adding another room can be a good investment. Add deck, patio or front porch. These exterior additions are an inexpensive way to increase your house’s size and create additional usable space. Finish attic and basement. This is an easy way to add space to your house. Remove popcorn ceiling. No one wants this dated look. Fix plumbing. If you have old plumbing that is causing problems, fix it before other superficial updates. Beautify your front yard. This can be a cost-effective way to boost your home’s curb appeal, and you’ll probably enjoy having a home with new paving stones or plants. Younger people, especially, want wood floors in a home. One survey found that you can recover 91 percent of your installation costs, which average $5,500. To refinish hardwood floors, which costs $2,500 on average, you can recover 100 percent of your expense. Choose between solid wood and engineered wood. Solid hardwood is one piece of wood, and engineered wood comes in layers. Each has advantages and disadvantages, including cost and strength. Kitchens and bathrooms are typically the most expensive rooms to remodel, but they can instantly boost a home’s appearance or bring it down. One survey found a 66 percent return on fixing up the bathroom and an 83 percent return on redoing the kitchen (averaging both minor and major fixes). However, one expert warns that if your house only has one bathroom, it’s better to add a second instead of renovating the one. The national median price for upgrading a kitchen is $30,000, with an ROI of 67 percent for a major remodeling. Although not as impressive a return as improvements such as new siding or roof replacement, a renovated kitchen or bathroom can bring a lot of pleasure while you are still living in the home. For the kitchen, experts recommend wood cabinets, stainless steel appliances, natural wood or stone floors, and stone countertops. If you can afford it, create a more open layout, especially if your kitchen is cramped. If your budget is tight, consider refacing instead of replacing cabinets. At the high end, bathroom fixes can include replacing tubs with walk-in showers or steam showers. However, simply regrouting the shower, adding new fixtures and repainting can make the bathroom look almost new. For other ideas, see the sidebar. “Home Improvement Projects That Pay Off,” April/May 2016, AARP. “Which Home Improvements Pay Off?,” HGTV. “10 Investments to Boost Your Home's Value,” DIY Network. “The 6 home renovations that return the most at resale,” June 28, 2016, Bank Rate. “Home Remodeling: 6 Improvements to Increase Home Value,” House Logic. “Key Trends in the 2016 Cost vs. Value Report,” Remodeling. “New Roof Is Greatest Remodeling Value,” Dec. 09, 2015, Daily Real Estate News.